In the last two fundamentals articles I have been looking at the edit tools. These are the most accessible route into editing material on the timeline. However when making edits or moving clips on the timeline the way in which Pro Tools responds is largely governed by the edit modes. The edit tools are accessible using F5-0. The edit modes are accessible using F1-4. If you are using a mac it might be necessary to enable “Use all F1, F2, etc. keys as standard function keys” in system preferences - keyboard. If you prefer not to give up the volume, brightness and mission control functions then the use of the Fn key will give access to a traditional F key while keeping the mac-specific functions available. If you enable standard function keys in sys prefs then the mac-specific keys are available if you press Fn. Users of other DAWs often look for an equivalent to “snap” settings. Slip and Grid modes are the equivalent to snap on/off in other DAWs. Slip - Unconstrained movement on the timeline, AKA “Do what you like” In Slip mode you can make selections and move clips freely down to sample resolution. This is the equivalent of snap being switched off in other DAWs. Grid - Movement constrained to multiples of the current grid setting, AKA “Snap to Grid”. In Grid mode you can make selections and move clips on the grid. Shuffle - Movement of clips is constrained by other clips, with clips “shuffling” past each other to change order. AKA “Like arranging scrabble tiles”. Shuffle mode is far easier to understand by trying it than explaining it. Shuffle mode forces clips to swap places with each other and it will not allow gaps to be created while in shuffle but preserves pre-existing gaps created in other modes. The new position of a shuffled clip is indicated by a yellow line. I’ll often tell people to imagine gravity is pulling all the clips to the left. Spot - Placing clips in a specific location by typing in the desired timeline location. AKA “where do you want it?”. Spot mode is principally associated with post-production and while it is indispensable to the post community it is also really useful in music production. 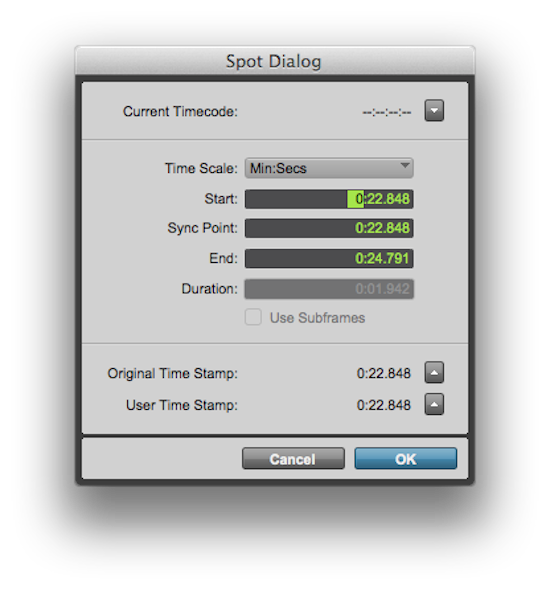 In spot mode, rather than allowing the grab tool to move a clip, grabbing opens the spot dialogue which allows precise placement of the head, tail or a sync point in the clip to a specific location by typing in the relevant timecode or equivalent timebase (minutes and seconds, bars and beats etc). The Grid settings are set in the drop down window to the right of the main counter. Grid settings can be in any of the main timebases. The most common setting for music production is bars and beats but see the “which mode do I need?” section below. Grid lines appropriate to the current setting can be displayed on the timeline by clicking the word “Grid” next to the grid selector. My recommendation is always to work at the coarsest appropriate grid setting. I find many beginners either try to leave their grid settings unchanged (often at 16th note) and then find they are placing whole bar clips slightly off the bar lines when zoomed out a little further, or abandon grid mode in favour of slip when they find grid mode snapping prevents them doing what they want. Changing grid settings according to what you are doing is the best way to work and if you want to speed up your workflow using the shortcut Ctrl+Opt+Numeric plus or minus/Start+Alt+ Numeric plus or minus will change your grid setting quickly. An invaluable use of spot mode is to return a clip which has been moved back to its original location. Because Pro Tools timestamps new recordings, if you find you have inadvertently moved a clip from its original location it can be easily returned by grabbing it in spot mode and clicking the upward arrow button in the original time stamp field. This will paste the original time stamp into whichever of the start, sync point or end fields is currently selected. By default it should be the start field. This will restore the clip to its original location. Which mode do I need? That depends on what you are doing but broadly speaking, if you are “producing” in the sense of desktop production using Midi, loops and samples, you want grid mode. Probably with tick-based tracks but that is a conversation for another day. If you are recording to a click track you probably want grid mode too. If you are using Pro Tools as a multitrack recorder and not using a click, then the session’s grid won’t have any relevance to the recording and you should be working in slip mode unless you have tempo-mapped the audio after recording it (if you are a beginner you probably won’t be doing this). There are lots of times shuffle mode is useful but it tends to be a mode which gets used for a particular task before reverting back to another mode. The same is true for spot mode, especially for musicians. Largely the choice of mode will be slip or grid depending on whether or not the material on the timeline relates to the grid. If you have been following the last three fundamentals articles you should now know what all the F keys do, from 1 to 0. If you can’t remember just refer to the UI as they are in the same order in the UI as they are on the keyboard.